Growing roses, gerberas and lilies on 16 colorful acres, Janet works alongside her parents and husband in the family business that is also home to 45 employees. The company has made a name for itself, not only as a showcase for the beauty and quality of California flowers, but also as North America’s only licensed grower of David Austin cut English roses. Next time you buy cut flowers, make sure they’re from California — and keep the floral industry blooming! California is home to more than 250 flower farms. California produces more than 75 percent of the cut flowers that are grown in the United States. California’s flower farms have a $10.3 billion economic impact in California and the United States. For every dollar a California farmer earns, 92 cents goes right back into the local economy. California cut flowers meet the strictest growing standards in the world. Nationwide, consumers purchase an estimated $17 billion of floral items annually. Buy California grown flowers. When you buy California grown flowers, they were probably in the field 24-48 hours ago. This helps ensure maximum freshness and longer enjoyment. Remove leaves. Discard leaves that will be submerged in water. This will decrease bacteria buildup and lead to a longer-lasting bouquet. Fill vase with cold water. Cold water slows down blossoming. You can even add ice cubes to your vase water for extra coolness. Cut your fresh flower stems to desired length. It’s best to cut them at a 45 degree angle to allow more water to be soaked up. Use flower food and change vase water often. 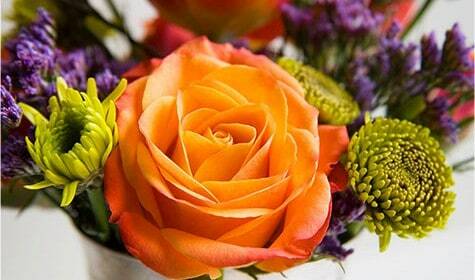 Flower food is a must in keeping your flowers fresh, as is changing the vase water every 2-4 days. Design your arrangement. Large and dark flowers should be close to the base of the design, and small and light-colored flowers look best on the outer edge.